Marvel’s Iron Fist first Official Trailer! Marvel have just released the first full-length trailer for Iron Fist, the newest of their Netflix-exclusive “Defenders” TV shows. I think it’s a great trailer, always been a fan of the character, so really looking forward to this series! I agree, Daredevil Season 1 was brilliant! I’ve always liked the character of Iron Fist as well, so hope its as good as Daredevil. I thought it was a good trailer, gave a good sense of what the new series will be like. Iron Fist has always been one of my favourite characters as well, so looking forward to the series. Although the Netflix MCU shows were terrific, Luke Cage was not exactly top tier. Hopefully, Iron Fist will be a much better superhero show. Plus the shots of his glowing fists totally sold the trailer. I agree, I liked Luke Cage, but I preferred Daredevil. I’ve always like the character of Iron Fist as well, so I’m certainly looking forward to this new series a lot more after this trailer – it was so action packed! Looks like it could be a lot of fun. Still haven’t finished Daredevil Season 2 or Luke Cage, so I need to start catching up soon. Its looks really good, I’ve always been a fan of the character, so looking forward to this series as well. Very much looking forward to this, as I have with the other Marvel Netflix shows. I’m hoping I’ll get around to reading some Iron Fist collections soon. This looks great so far BUT we need Iron Fist to don a costume! I dig the ‘real world’ style of the Netflix series but I personally would like some more costumed vigilantes & supervillains. The latest Powerman and Iron Fist comic series has modified Iron Fist’s costume in a way I think would translate nicely to the series, we’ll see though! I agree, the Iron Fist costume in the comic now would make a great addition to the TV show. I’m sure Danny will get a costume eventually, but it took the whole of Season 1 for Daredevil to get his costume, so we might have to wait a bit. I’ve always liked the character of Iron Fist so will be interesting to see what Supervillians turn up next. For me, Netflix can do no wrong when it comes to Marvel. Can’t wait!! I agree, the Netflix shows have all been so good, especially Daredevil! 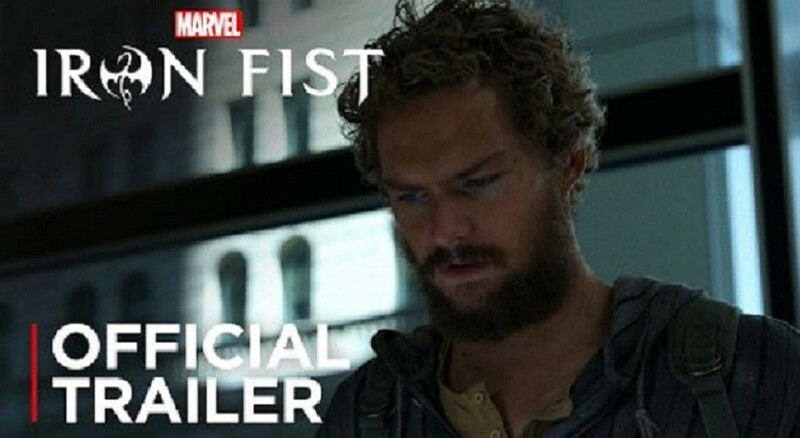 Can’t wait for the new Iron Fist series, its gonna be great! The trailer looks great and shows once again that this is where Marvel is strong right now – presenting characters in live action. The best thing about the trailer and reading this – finding out that the premiere is just one month away!